Jason just fell in love with the program as soon as he started referring it to customers," Laura Weber, co-owner of Clark's added. It's a great tool, and it's super easy to use. Clark's Car Care started as a small operation, but had a great opportunity to grow by joining the Synchrony Car Care family years ago. ÉGmjÕjkl[gflY[lYlKqf[`jgfq;Yj;Yj]oYkfYe]\ Bruce," Matt recalled, "and he walked in and saw me jmffaf_Yjgmf\&A`Y\gf]daø$Y^YpeY[`af]Yf\log quarts of oil. But Bruce had faith in us. And now we have grown to have the highest revenue in our area for more than eight years." "It just clicked," Laura said, "and it's been great ever since." Matt appreciates that customers get a reminder of his shop in their wallets. "Another beautiful thing is that it says Clark's Car Care right on the card, so that helps with the business. When the customer needs more work, they've already got the credit card in their wallet." Hdmk$l`]klY÷Yl;dYjcÌk;Yj;Yj]j]_mdYjdqlYc]khYjl in free Synchrony training. 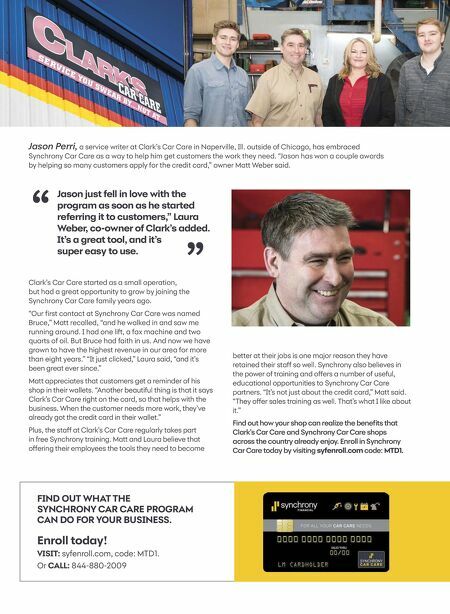 Matt and Laura believe that g÷]jaf_l`]aj]ehdgq]]kl`]lggdkl`]qf]]\lgZ][ge] Jason Perri, a service writer at Clark's Car Care in Naperville, Ill. outside of Chicago, has embraced Synchrony Car Care as a way to help him get customers the work they need. "Jason has won a couple awards by helping so many customers apply for the credit card," owner Matt Weber said. 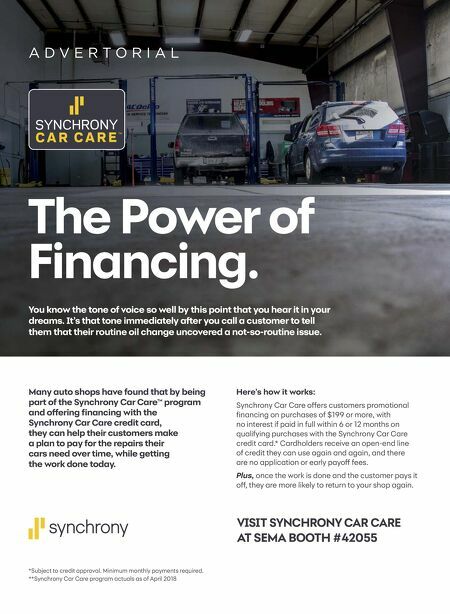 FIND OUT WHAT THE SYNCHRONY CAR CARE PROGRAM CAN DO FOR YOUR BUSINESS. Enroll today! VISIT: syfenroll.com, code: MTD1. Or CALL: 0,,%00(%*((1 better at their jobs is one major reason they have j]lYaf]\l`]ajklY÷kgo]dd&Kqf[`jgfqYdkgZ]da]n]kaf l`]hgo]jg^ljYafaf_Yf\g÷]jkYfmeZ]jg^mk]^md$ educational opportunities to Synchrony Car Care partners. "It's not just about the credit card," Matt said. ÉL`]qg÷]jkYd]kljYafaf_Yko]dd&L`YlÌko`YlAdac]YZgml it." >af\gml`goqgmjk`gh[Yfj]Ydar]l`]Z]f]Õlkl`Yl Clark's Car Care and Synchrony Car Care shops across the country already enjoy. Enroll in Synchrony Car Care today by visiting syfenroll.com code: MTD1.